Juicing as a trend has changed the way the world viewed nutrition. Inveterate juicers argued that far from being unhealthy, juicing is a perfectly scientific way to get more out of the fruit. It’s certainly easier to drink a glassful of juice squeezed out of ten oranges than to actually eat ten oranges. You get all the goodness of ten oranges in a single glass. It is also easier to make your own combinations out of fruit and vegetables to increase the nutritional value of the juice. Juicers also believe that with the fibre already broken down during the juicing process, your body gets to absorb more of vitamins and minerals in the produce. But this is precisely the reason why juicing is not good for diabetics, because along with the nutrients, the body also ends up absorbing a whole lot of sugar. A study published in the British Medical Journal found out that diabetics can benefit more from the whole fruit rather than from its juice. Juicing can, in fact, be harmful. The study conducted on 66 105 women found that eating whole fruits like blueberries, grapes and apples is associated with lowered risk of diabetes. Fruit is rich in fibre, antioxidants and phytochemicals, which are extremely good for diabetes. What’s in fruit juice? 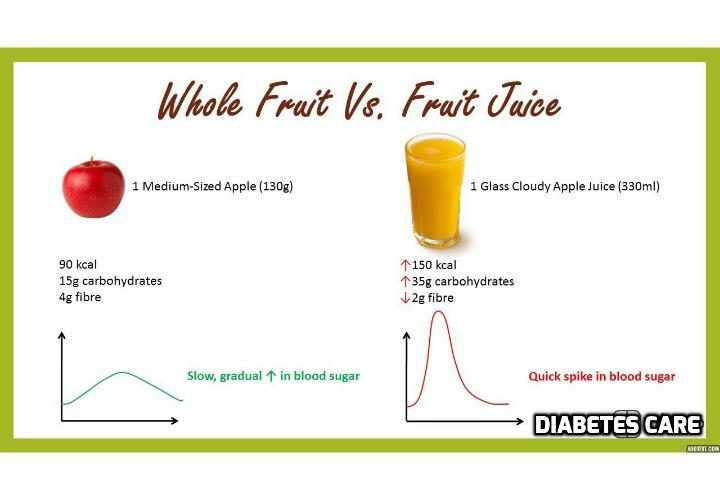 Why is fruit juice not Good for Diabetes? As can be seen here, even if you haven’t sweetened the juice with extra sugar, fruit juices contain a lot of natural sugars. And without the fibre content to slow down the digestion, fruit sugars are absorbed more readily into your system when you have juice. Diabetics who are trying to manage their weight may also suffer from juicing. The excess sugar and the dearth of fibre can cause weight gain instead of weight loss. So ditch juicing and grab a whole fruit instead. Try eating nutritious whole fruits like apples, pears, grapes and citruses which can not only help you manage your blood sugar levels but also supply you with essential micronutrients. * Pomegranates contain the richest combination of antioxidants thereby, protecting you from free-radicals and chronic diseases. They play an important role in lowering the levels of bad cholesterol and resistance, which the body has against insulin. * Apple is a hypoglycaemic fruit which contains plenty of fibre that is an impeccable ingredient for a diabetic. It also contains the chemical Pectin, that has the capability of reducing blood sugar levels and the requirement of insulin in the body by almost 50%. * Guava with a low glycaemic index, guava is very rich in dietary fibre that helps ease constipation (a common diabetic complaint) and can lower the chance of developing type-2 diabetes. Guavas are also high in vitamin A and vitamin C.
* Papaya Natural antioxidants in papaya make it a great choice for diabetics. As diabetics are prone to many ailments, like heart or nerve damage caused by irregular blood sugar levels , the diet having papaya can obstruct future cell damage for a better and longer life span. * Jamun – Its leaves are good for diabetic patients. As it has anti-diabetic features. This helps to convert starch into energy and keep the blood sugar levels in check, it has low glycemic index. It reduces the symptoms of diabetes like frequent urination and thrusting. * Orange -The glycemic load of an orange is about 5, a low number that indicates that only small rise in blood glucose.Be cautious don’t consume orange juice. * Amla has a good source of chromium which shows positive effects on the pancreas, where insulin is produced and therefore helps to manage blood sugar levels.